Today we meet a British statesman at the close of his life, when the sun had very definitely set on his successes. 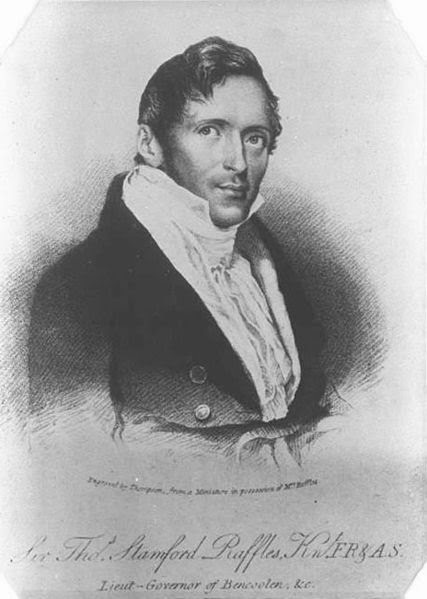 Known as "the Father of Singapore", Sir Thomas Stamford Raffles founded a city that grew far beyond its boundaries into the modern Republic of Singapore. A driving force in the Empire, a strategist, businessman, administrator and pillar of the establishment, Raffles also found the time to champion an institution that exists to this day, London Zoo. Raffles had spent years away from England, travelling the furthest reaches of the world and serving as Governor and administrator in several lands on behalf of the East India Company. His health had never been robust and the years of travel and tropical climes exacerbated his problems until he decided to return to England and settle there once and for all. Travelling with Raffles was his second wife, Sophia Hull, his only surviving child, Ella, having been sent back to England some years previously. His first wife, Olivia Mariamne Devenish, and four other children, had all died during the years spent overseas. After a year spent travelling from Singapore, the fragile couple retired to Cheltenham where they remained for several months as their health recovered enough to rejoin the social whirl of London. Finally, in the winter of 1824, they began hosting illustrious gatherings in the capital at their new home in Berners Street. With his political ambitions sparked by this change of lifestyle, Raffles began to consider the possibility of taking a parliamentary seat but instead he found himself embroiled in a bitter feud with Major William Farquhar, a sparring partner from their days in Singapore, when the men jostled for power and influence over the city. Indeed, Farquhar had never forgiven Raffles for removing him from his post as 1st Resident of Singapore, a position he was forced to forfeit thanks to what Raffles saw as his lazy, immoral ways in office. Brushing aside the complaints and criticisms of Farquhar, who accepted a military promotion in return for letting the matter rest, Raffles' political interests waned and he began to devote more time to his passion for the natural world. Eventually he founded the Zoological Society of London and the London Zoo, happily accepting the position of president in 1826. However, there was little time for him to celebrate these achievements as Farquhr was not the only person to have a beef with Raffles and he found himself required to pay over £20,000 in restitution for mistakes made during his career in the east. This sudden reversal of fortune was a body blow for Raffles and he left London and moved to his country estate, Highwood, where his already frail health went into terminal decline. On the day before he was due to celebrate his birthday, Raffles died of a brain tumour at the age of 44. His estate was forfeit to the East India Company to settle his debts and his wish to be buried at St. Mary's Church, Hendon, was denied by the vicar, Theodor Williams, who objected to Raffles' anti-slavery stance as his own family had made their money in that trade. Although a memorial tablet was finally put in place in 1887, Raffles' body seemed to have disappeared. However, fate took another turn in 1914 when the Father of Singapore's remains were found within a vault at the church. With restoration work done on the building throughout the 1920s, he was finally laid to rest within its walls, with a new memorial plaque laid to honour his memory. How Christian of the vicar; refusing to bury Raffles because Raffles opposed slavery. The vicar used his meagre power most small-mindedly, to deny a man, now dead, the shelter and dignity of where to leave his earthly remains. I agree wholeheartedly. I'm glad Raffles got his wish in the end, but the vicar behaved most uncharitably. I wonder what happened to his wife and child after the East India company seized his assets to cover his somewhat odd debts. Lady Raffles was allowed to live on at Highwood in reduced circumstances, dependent largely on her own family. Sadly, Ella died at the age of 19 just before her wedding to John Sumner, son of the Bishop of Winchester. Very interesting post as my wife is from Singapore. I saw quite a few references to Raffles when I visited Singapore. I would love to visit, it's one more place on my long list of "must see places". She died of tuberculosis, sadly. Have you read Victoria Glendinning's biography of Raffles? I haven't but I think I need to! I have always been fascinated by Raffles ever since I lived in Singapore when I was younger. I had no idea of the circumstances of his death. He achieved a great deal if he was only 44 when he died! Great post about a fascinating man. I've heard about Raffles for years, but never knew more than his name. What a strange world it must have been in those years as Englishmen squabbled all over the Empire the sun never set on--and then such a tragedy about the ignoble vicar after his death. It makes me feel that much more for his widow. What miseries people inflict on each other! Thank you; he really is an intriguing character. I hope she will enjoy it! How wonderful, it's a place I'd love to visit!